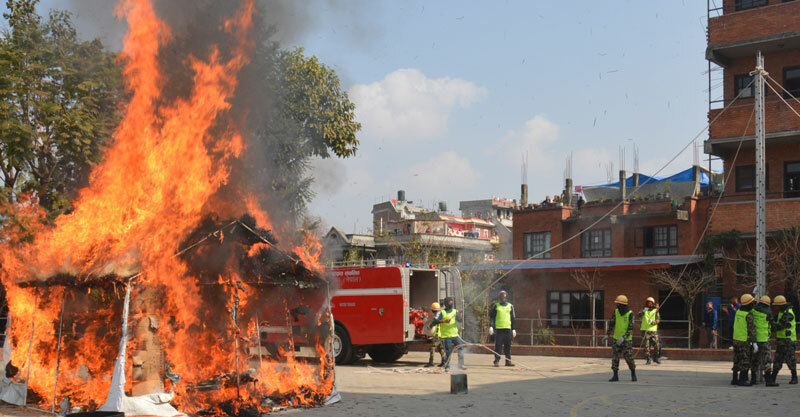 Everest English School, which has been disseminating education along with practical experience, conducted a fire extinguishing and rescue practice within the school premises along with the technical assistance of Juddha Fire Brigade, Bhaktapur. Everest Interact club, Everest Scout Troop and Everest Junior Red Cross Circle were involved for the fire control and recue. They were supported by the technical human resources from Fire Brigade office. Hand fire extinguishers were used to put off the fire and by using of special ropes, casualties were rescued from the third floor of the school building. Besides, students were provided information for the formation of temporary stretchers for first aid purpose. In his welcome speech, the founder-principal of the school said that fire can take place due to a minor negligence and we should not be worried but act carefully adopting all the safety measures to control it. He also said that the rescue team, at the cost of their own life, are really praiseworthy, and he appreciated Mr. Bijay Dhaubadel for providing assistance for the programme. At the end, a rally with play cards was taken out for awareness, which reached at different part of Bhaktapur city.